The Cinephiliac Moment is a weekly series in which I choose a moment in a film where cinema reaches transcendence. This moment may be inspired by anything – the composition, the score, the edit, the narrative – but it is a moment in which cinema becomes something more than entertainment and possibly more than art. Read more about the original inspiration to the project here. 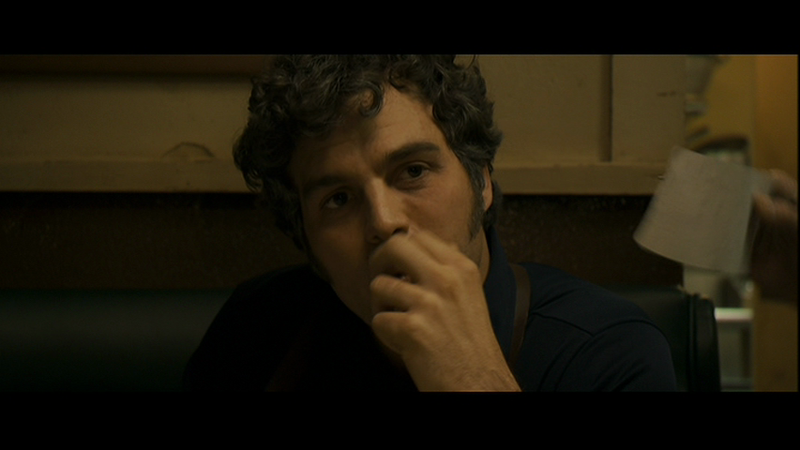 Like all of David Fincher’s work since entering the digital era, Zodiac uses compositions within his frames that are tightly wound and filled with layers. Details are never just casually thrown together, though unlike his 90s-auteur counterpart, Wes Anderson, Fincher never emphasizes them. They are often the background, but they mean everything. There’s not a wasted moment or image in Fincher’s tale of three men driven to obsession by an elusive serial killer – even the film’s breathtaking avant-garde three minutes of darkness illustrates the passage of time for these men. So as Robert Graysmith and Inspector Toschi meet for the last time, we’re in so deep to every detail that our eyes are glued to the screen as the final clues are set into place, literally, as Graysmith uses various diner objects to lay out the groundwork for why he has identified the killer. As he lays down his final clue, a waitress comes over and drops off the check. Why? Why would Fincher throw in this random detail – especially one that may distract from our obsession in the case – to have of note that a check has been thrown down? Because it’s the film’s joke on these characters. The total has been added up. And what does it mean? Nothing. It’s just a total. We’ve watched this film for 160 minutes and Fincher has made us as intent as his characters searching for the truth. And what do we get? A small check that shows the total of their efforts. Unlike The Girl With The Dragon Tattoo, in which Fincher de-emphasizes the clues of his case by dislocating the dialogue from the visuals, Zodiac does everything in its power to make us look as much as listen (consider the film’s breathtaking interview with Arthur Leigh Allen). So we notice something as mundane as the waitress dropping this check, and immediately question it in its validity in the case. And then we realize it has no meaning - as the final clues come together, why look at the total? It’s a meaningless total. Much thanks to Jim Gabriel for the screencap above.